The UPS guy showed up right before Gillian and I left for Chris and Kathleen’s wedding. When the UPS guy shows up, 9 times out of 10 he is bringing me car parts, this time was no exception. 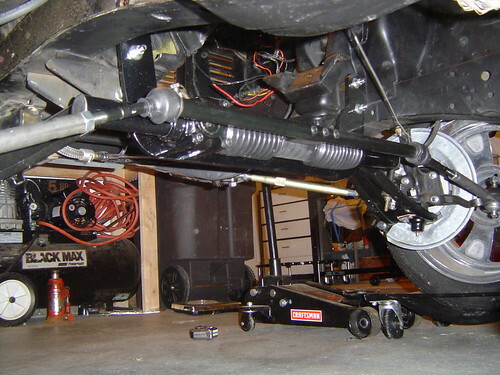 I bought a rack and pinion steering kit, for The Falcon. So far I have installed; disc brakes on the front and rear and new master cylinder, new rear end gears, new shocks, and new wheels and tires. Now I can add rack and pinion steering to that list. No, I haven’t finished building my engine yet! It is a lot easier to work on the steering with out an engine anyway. I still have to install the steering column. This will be the hardest part because it involves me getting my head and hands down where my feet would normally go. I plan to have it running some time during the summer of 2009, possibly with a new 5 speed transmission. This entry was posted on October 1, 2008 at 3:23 am and is filed under Broken, Cars, Falcon. You can follow any responses to this entry through the RSS 2.0 feed. You can leave a response, or trackback from your own site.